About This Site - Why the name Anaspides Photography? I wanted to find a web site and business name that was distinctly Australian, yet had links to other geographical regions. My training as a geologist, in particular a paleontologist drew me to select a name of a small shrimp named Anaspides. Anaspides is a small freshwater shrimp-like crustacean belonging to the family Anaspididae. Within the family there are three genera: Allanaspides, Anaspides and Paranaspides, all of which are restricted to the island state of Tasmania in Australia. Anaspides tasmaniae belongs to a primitive group of crustaceans known as Syncarids. Although, the Syncarids are cosmopolitan inhabiting other regions in Australia, New Zealand, Chile and Argentina. Anaspides tasmaniae is only found in Tasmania. 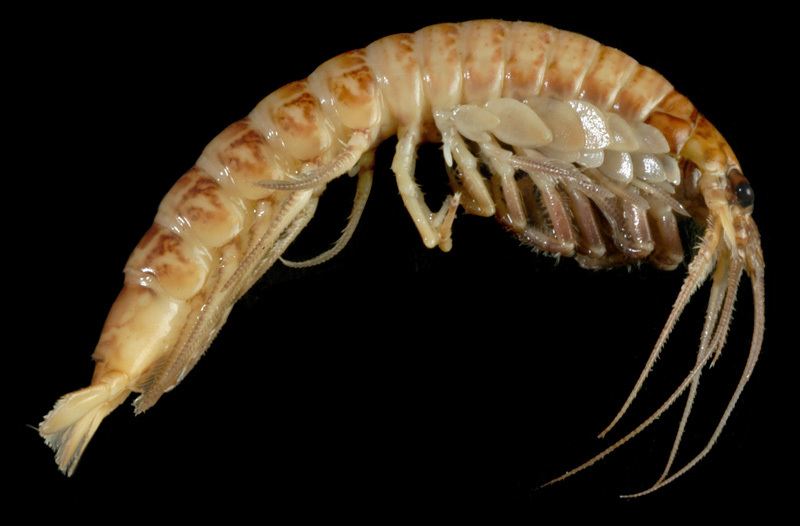 Many Tasmanian endemic invertebrates are believed to be have originated from ancient Gondwanan ancestors and Anaspides tasmaniae have been described as a living fossils. The small freshwater mountain shrimp has essentially remained unchanged since the Triassic Period 250 million years ago. Fossils of almost identical creatures occur in the Permian and Carboniferous rocks of Europe and North America which have been dated at 215-350 million years old (perrier et al., 2006). Anaspides tasmanae feeds upon algae from rocks on the bottoms of streams and highland tarns, or may capture insects that fall onto the surface of the water. It turns on its back to capture them. The order Anaspidacea contains four families that have sometimes been divided into two suborders, the Anaspidinea and Stygocaridinea. The family Anaspididae has been known since the Triassic and exhibits strong relationships to the extinct order Palaeocaridacea. Anaspidaceans are generally thought to be among the most primitive of eumalacostracan crustaceans (subclass Eumalacostraca), especially because their thoracic limbs possess both epipods and exopods. However, details of their circulatory system, foregut morphology, and other aspects of their internal anatomy suggest that anaspidaceans are derived from ancestors leading to the eucaridan decapods. The lack of a carapace has caused debate about their exact placement among eumalacostracan crustaceans, but anaspidaceans are generally thought to be ancestral to at least the line leading to decapods, if not to some of the other eumalacostracan groups. The anaspidacean head does not bear a carapace. Eyes may be on stalks, sessile on the head, or absent altogether. The first thoracic somite is fused to the head while the remaining seven thoracic somites are free. The first thoracic appendage is modified as a maxilliped, that is, it has a different morphology from the remaining seven pairs of thoracic limbs, and is modified as a feeding structure. Thoracic limbs two through eight have the endopod developed into full walking legs. On these appendages, the epipods, which emanate from the outside margin of the coxa, function as flattened gills, and the exopods, which come from the basis, function for water movement. Sometimes the exopods are not present. The pleopods may be strongly developed, reduced, or absent. In the Anaspididae, the telson and uropods form a tail fan, but in other families, the uropods are elongate and the telson short. Anaspidaceans can be up to 1.9 in (5 cm) in length, but some species are less than 0.39 in (1 cm). Color is usually a dull brown. The distribution of Anaspidaceans show a classic Gondwana relict distribution pattern, being found only in Tasmania, southeastern Australia, New Zealand, and southern South America. The family Anaspididae (of which there is only one species – Anaspides tasmaniae) are known only from a small number of localities in Tasmania, Australia, while the Stygocarididae are more widely dispersed with species known from Victoria, Australia, New Zealand, Chile, and Argentina. The first published record of Anaspides tasmaniae was made in 1893 from alpine pools on Mt. Wellington behind Hobart. Since then, it has been widely found on the Central Plateau, as well as in western and southern highland areas. The larger anaspidaceans are generally found in cool mountain streams, lakes, and swamps, while the smaller stygocaridineans are dwellers of the groundwater, living among the sand grains. The swamp-dwelling anaspidaceans live in the burrows of freshwater crayfish, while those found in lakes tend to live in the algal macrophyte mats on the lake bottom, and the stream-dwellers patrol over and among larger rocks of the streambed. LEFT: Detailed phorograph of Anaspides tasmaniae (Perrier). Anaspides tasmaniae typically is found in highland creeks and pools above 750 m in altitude. It has also been found in the underground waters of cave systems. Anaspidaceans are not good swimmers. Instead, they spend most of their time walking over the substrate. The exopods of the thoracic legs are in nearly constant motion, most likely circulating fresh oxygen-bearing water past the flap-like epipods. When walking, the legs move in a metachronal pattern, which continues to the pleopods. In the larger species, the pleopods have the same motion as the walking legs, so that at first glance the animal looks to have a continuous set of legs all the way to the posterior end of the body. When startled, anaspidaceans are capable of an upward jump in which the body is flexed about midway along the back. On relaxation, the animal settles to the bottom and walks about as if nothing had happened. There appears to be no territoriality in anaspidaceans. When two individuals meet, they may touch antennae, but as often as not, one merely walks over the body of the other. Anaspides may be seen crawling across the bottom of a pool or stream, or else swimming near the water surface. It is a very shy creature, however, and when disturbed will dart into shelter with a sharp flick of its tail. Anaspidaceans are generalist feeders, eating organic detritus obtained from the substratum. The larger species may also be scavengers and appear capable of scraping organic films from the surfaces of small pebbles. They feed on submerged plant material such as algae and mosses. They may also prey on other aquatic animals such as tadpoles and worms. Anaspides has been observed preying on small insects that have fallen onto the surface of the water. To capture its prey the shrimp rolls onto its back. Mating has so far not been observed in this group. Egg laying occurs mostly in spring. The 1 mm diameter eggs are attached to submerged plant debris or stones. There is no maternal caring for the eggs or the juveniles. Eight months or more later, the eggs hatch when the young are 2 mm to 3 mm long. The longer developmental periods are associated with an over-wintering dormancy period. They will breed about 15 months later when approximately 18 mm in length. Individuals may live for 3 or 4 years. Anaspidaceans are restricted in their distribution, but for the most part occur in areas where landscape development is minimal. As with many Gondwanan freshwater crustaceans, however, the introduction of trout into the rivers and streams by European colonizers has meant that some species survive only in the small tributaries where fishes cannot go. These crustaceans evolved in the absence of freshwater fishes, so they have no natural defenses against those introduced predators. At present, none of the anaspidaceans are considered to be threatened, and none have been listed by the IUCN for inclusion in the Red List. Anaspidaceans represent an interesting evolutionary branch of crustaceans, and as such, are important in telling the history of life on Earth. "SYNCARID CRUSTACEANS FROM THE MONTCEAU LAGERSTA¨ TTE (UPPER CARBONIFEROUS; FRANCE). This paper provides and very good synopsis of the evolution of this "living fossil".